Thank you to all of the brothers, friends, and family for their years of support to make 121 E Lake St Renovation a reality; and to all who came to celebrate with us Saturday. What an amazing weekend! Click this photo to see the full photo album from our ribbon cutting..
March 2016 - Home Stretch! 121 E Lake Construction has gone tremendously well. We are in the home stretch with completion scheduled for May. Thanks to the great work of Mitch Christ '79 and the Dohn Construction team, we are slightly ahead of schedule and on budget with only one small budget increase. Our beloved 121 E. Lake is finally under construction! Asbestos abatement is complete and demolition is well underway with nearly everything inside the house gutted out to the bare studs including all the old plumbing and electrical systems. We have cut into the basement floor and have started new underground plumbing and new footers to support the new Library addition. The roof on the kitchen has been removed and is ready for steel structure and framing to begin for the new Library addition. Many thanks to all the Colorado Gamma alumni who have generously donated to this renovation project and the vision to preserve and continue our Colorado Gamma legacy!! Our diligent work with the City of Fort Collins and our current fund raising efforts have enabled us to start the project that includes all new energy efficient infrastructure consisting of new doors and windows, new insulation in the roof and exterior walls (where none existed before), new full wet fire sprinkler and fire alarm systems, new state-of-the-art Variable Refrigerant Flow (VRF) HVAC system that will provide simultaneous heating and cooling (we have never had cooling in the house before), new 3-phase electrical power to the house, all new electrical systems, and LED lighting. We are adding on a spectacular new vaulted ceiling Library, upgrading bathrooms, remodeling the kitchen, and adding a new laundry room. Construction costs have increased very significantly since we started the initial planning and design for the project. With our current tight budget we have prioritized the infrastructure for the house and the new academic Library addition as places where we will not compromise. However, the level of finishes that are currently specified are at a very modest level and we are short on funds to provide long-lasting, attractive and durable furniture, fixtures, and equipment (FF&E) when we occupy the house. We also had a surprise when the asbestos abatement operations required total remove of the existing hardwood floors in the Entry and Dining Room – thus requiring a total new floor rather than refinish the existing. It would be really awesome if we can raise the level of finishes so that we end up with a truly stunning new fraternity house that invokes a WOW response when walking through. It can be one of the very best SigEp properties in the country that makes us all proud and will be a model for the next generations of CSU academic–centric Greek life. This newly restored classic fraternity house at 121 E. Lake Street will rival any new student housing options for college students and will be huge asset to our organization during rush as we look to recruit future generations of academically strong and leadership minded Sig-Ep brothers to continue our 100-year old legacy at CSU. We are reaching out to all of you who have not yet participated in the project fund raising campaign to please do so as soon as possible. 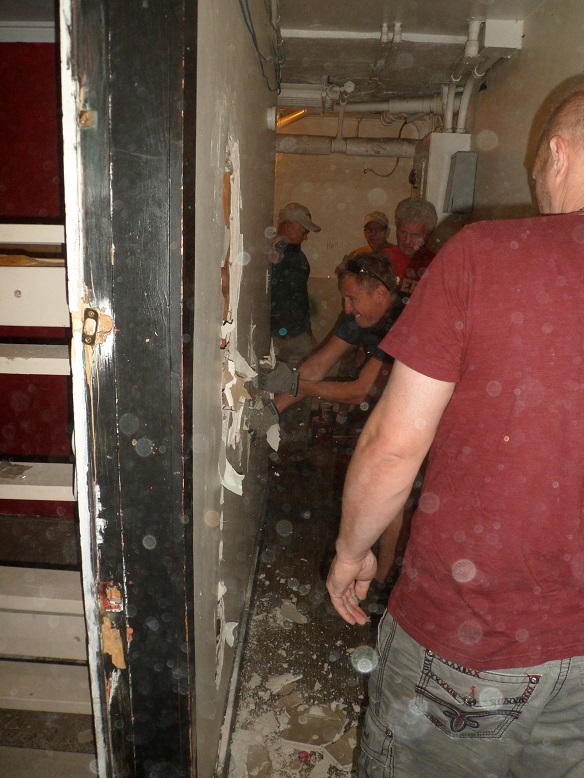 We need to extend our fund raising goal from $1.25M to $1.6M so we can upgrade our finishes, replace the main level flooring and establish an adequate FF&E budget. Our final materials procurement activities will be occurring in the next 60 days, so please do not procrastinate and go to www.CSUSigEp.org/Giving to make a donation. Demolition is rolling along at 121 E Lake St and things are starting to look very different. 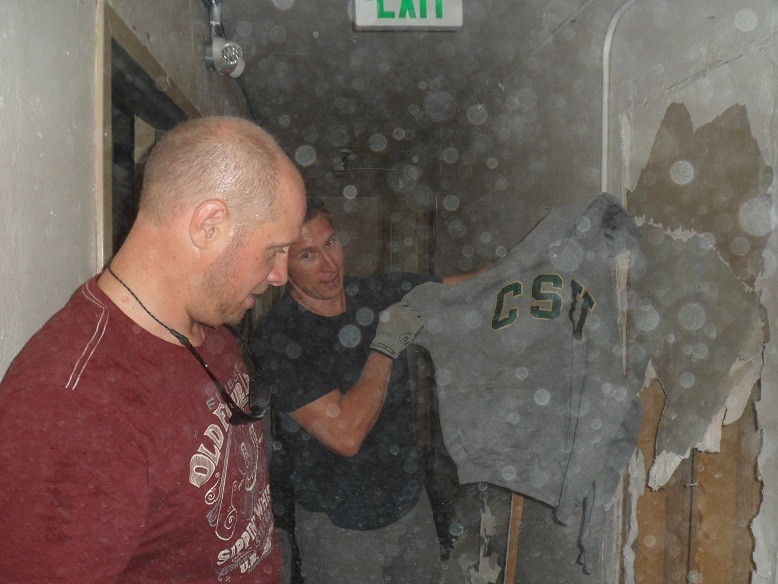 After two week of asbestos abatement, full demo started after the 4th of July holiday weekend. The basement has been gutted and the "forrest" of intertwined shrubs, trees, and weeds next to the alley are gone. Check back soon for more updates and photos and we'll see you in October for the Centennial Homecoming and construction tours! Thanks again to the 150+ alumni brothers who made this project possible. If you haven't made a pledge/gift, we need more support before construction is completed, so please join us. 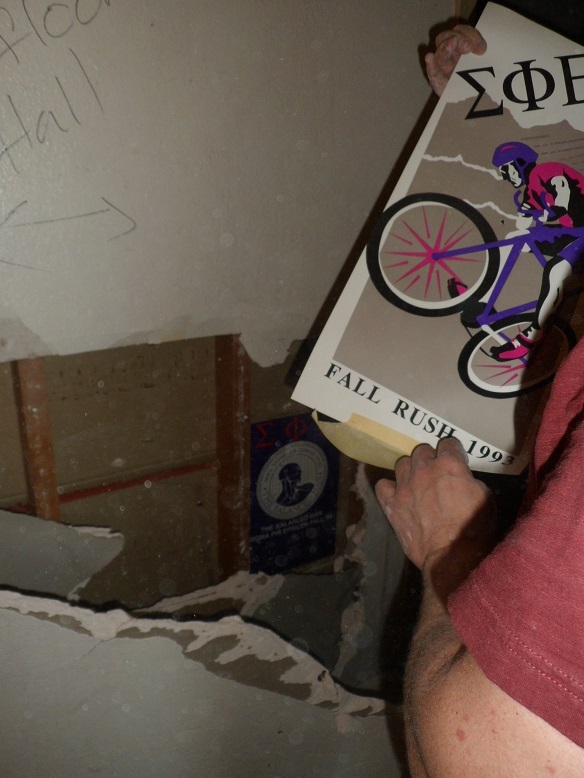 With construction starting Monday, June 15th, a few alumni brothers got together with Rita to see what kind of treasure the hallowed halls of 121 E Lake Street might hold. Below are some highlights and don't forget to register for the Centennial Homecoming celebration in October to see the "121 E Lake Time Capsule" exhibit. June 13, 2015 Pre-Demo participants: Al Hornung '61, Norm Warner '65, Mitch Christ '79, Dave Swinehart '75, Mike Jensen '96, Chad Ellington '99, and Rita Williams. The house at 121 East Lake in Fort Collins, Colorado was built in 1929 and requires upgrades to aging mechanical systems, electrical systems, plumbing systems, exterior and interior architectural finishes, and life-safety systems. The fraternity also needs to upgrade the functionality and livability of the house to meet demands of the new age of college student and Greek life that is attractive to recruiting and retaining new members as well as support the mission of the Sigma Phi Epsilon fraternity to promote the Balanced Man philosophy and support creation of an accredited Residential Learning Community. Successfully achieve the stated fraternity needs with implementation of a major renovation of the existing house and construction of a new 2nd story Library addition above the existing kitchen. Revised construction budget is $2,700,000. Director, Red Door House Corp.
With an excellent record on student housing projects for CSU, including Braiden & Rockwell Halls, we are thrilled to be working with Dohn Construction as the general contractor for 121 E Lake St full renovation. Ryan Sahd and the team at FirstBank in Fort Collins have provided the combination of local knowledge, great service, and big bank capability. We are pleased that construction financing for this project was provided by FirstBank. A+ has been recognized with awards for their work on historic properties in Fort Collins and works with CSU on new university student housing.